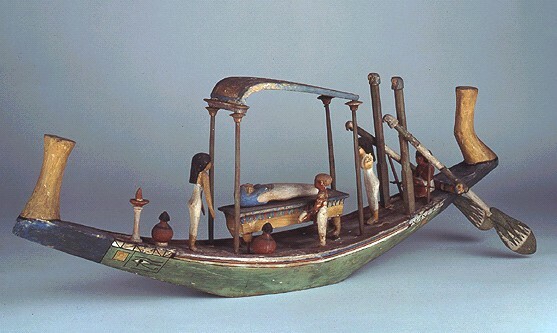 This painted wooden model represents a funerary boat bearing a mummy on a bier beneath a canopy. To the port side of the mummy stands the small figure of a man, holding in his left hand a partially unrolled papyrus. He is presumably a lector-priest, who would read the ritual text written on the papyrus over the body. There are actually some traces of a text on the papyrus, but it has not been possible to read it. Fore and aft of the mummy stand two female mourners; these women are usually representations of Isis and Nephthys, the sisters of Osiris and archetypal mourners. At the rear, between a pair of steering oars, the helmsman is squatting. On the deck are also a small offering table and a couple of pots. Actual size: Length 77.5 cm; Width 13.4 cm; Height 6 cm. All images reproduced by permission of the Trustees of the British Museum. Informational text provided by the British Museum.